From the website I found when searching for info on this year’s Tartan Day parade in NYC. The parade will be held on Saturday, 5 April, 2014 along Sixth Ave, beginning at 2 pm. When I was in Edinburgh this past January and trying to figure out the best way to reach Glasgow Airport, I had hopes that my journey would take me within sight of at least one of Andy Scott’s monumental outdoor sculptures. His most recent work, The Kelpies, erected alongside a canal near Falkirk in Scotland, was the one I most hoped to see (see photo below). No such luck, but here we are just a couple of months later and ten foot high scale models of Scott’s two gigantic (100 feet tall) metal horses will be installed in Bryant Park for a month! I was already planning to a trip to the Big Apple; Bryant Park is only a couple of blocks from my arrival point at Grand Central Terminal, so I’m sure to see this version at least once. Yahoo! Probably won’t satisfy my craving to see the real deal, but it’ll have to do for now. 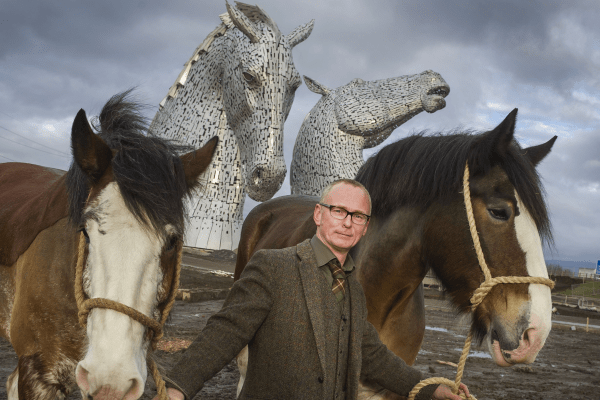 This entry was posted in European art, European festivals, News from Britain, NYC travel, Scotland, US travel and tagged Andy Scott, Kelpies, Kelpies Bryant Park, Kelpies in New York, Maquettes, Tartan Day 2014, Tartan Day NYC. Bookmark the permalink. These look great, now that the Telegraph readers seemed to think so. I read ten comments before reading a positive one about them! Several commentators complained that they were a waste of money. They seem to have forgotten the positive effects of the Angel of the North. Were they commenting on the full-size pieces or the scale models? If the latter, then they are missing the current trend of finding ways to bring art to those who If they are whining about the big ones, I can only shake my head and feel sorry for them. As for the Telegraph, I had to stop myself from writing it as Torygraph, after reminding myself that you’re from the US and probably wouldn’t understand the reference. It’s generally right-wing leaning and is seen as pro-Conservatives, commonly referred to as Tories (although our politics isn’t as right-wing as in the US so the Conservatives are probably closer to your Democrats than Republicans, after all the Conservatives recently legalised gay marriage. I couldn’t imagine the Republicans doing that!) But the Telegraph is a pretty respectable newspaper so I was surprised by the commentators. As a rule of thumb for British newspapers, avoid any whose titles are red (tabloid, sensationist rubbish) and avoid the Daily Mail (insidious, right-wing, bile posing as respectable). I don’t read papers much but when I do it’s normally the Independent that I go for. It’s politically independent (hence the name) and is generally quite balanced in its reporting (in my opnion). Thanks for the feedback, Lance. the Torygraph reference would have made sense in general, but I still tend to lump the Tories with our Republicans as both being more “rich white guy” clubs than the other side of the aisle, probably because my life isn’t affected by any decisions made in Parliament (unless it’s directed at tourism). That’s true. The Tories definitely are the rich white guy party. The fact that a significant part of the government cabinet comes from a single, prestigous, elite school certainly doesn’t help! And in the USA, there’s one go-to university for our spooks – Yale!